The fast food giant, KFC has officially done the unexpected and the seasoning of change is upon us. 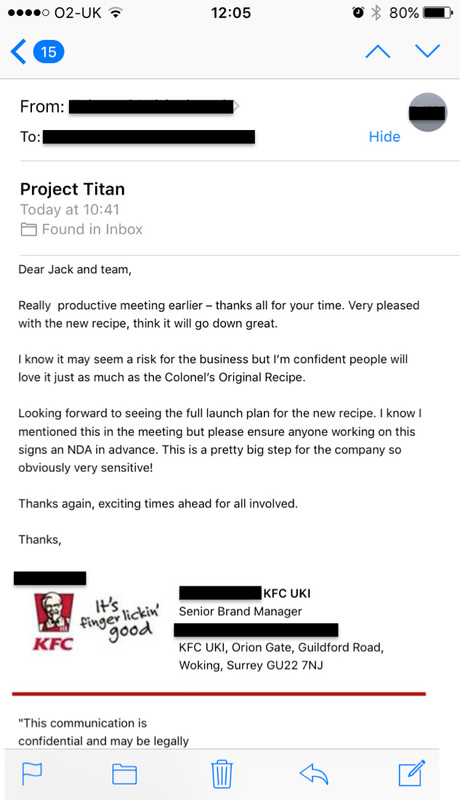 Colonel Sanders has let the proverbial chicken out the bag and revealed his famous fried chicken Original Recipe chicken has been given a special reboot, UNILAD can confirm. Today, for the first time in its long and delicious history, KFC has departed from its classic chicken on the bone, instead introducing an all-American addition, the Nashville Hot chicken. The new cayenne and paprika encrusted recipe, which comes served with the ever-controversial side of gherkins, will be rolled out in the UK for a limited time only. This news comes just a day after an internal email regarding Project Titan was leaked online. KFC scoured its homeland, the Deep South, to find the best authentic new taste for its chicken on the bone recipe. Inspired by Nashville’s original hot chicken shacks, KFC’s spicy and smokey Nashville Hot chicken is cayenne and paprika encrusted and served straight up with with gherkins. Legend has it that Andre’s great uncle was a bit of a ladies’ man and after a particularly late night out, his girlfriend made him fried chicken with extra pepper as revenge. As luck would have it, Andre’s great uncle loved the dish – he went on to create his own recipe and open a chicken shack selling the hot chicken which is still sold in the family today. For all you chicken traditionalists, fear not, the Original Recipe chicken on the bone is still available if the thought of altering your lunchtime food order sends shivers down your spin. Nashville Hot chicken is available in KFC restaurants nationwide from 22nd May to 18th June, subject to availability.